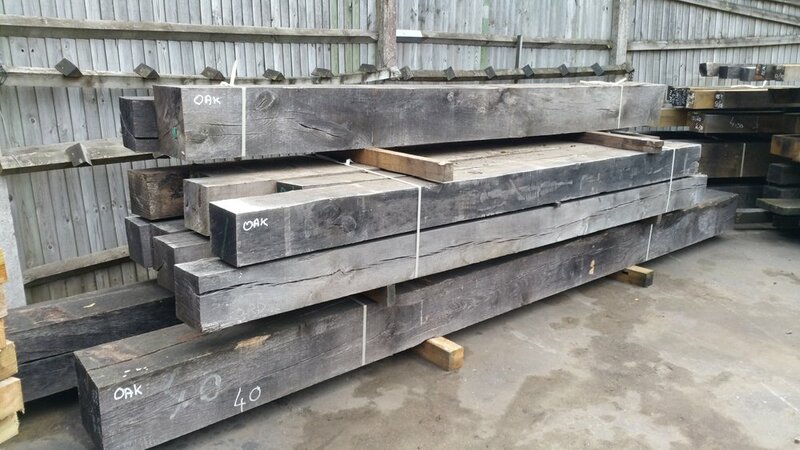 Oakfield Beams & Framing have just taken delivery of a sizeable supply of air dried and rustic oak beams to our yard in Horsham. We have selected sizes of oak beams perfect for anything from a fireplace mantel, to a set of large tie beams. All our air dried oak is available sawn to size and finished to bespoke requirement. We have available a large variation of sizes from 2.0m - 5.5m in lengths, 100mm to 350mm section sizes. Our stock varies in age from 4 years air drying to 10 years. The older the beams, the more rustic they are - having beautiful character and a darker hue when sanded. These beams are incredibly stable, perfect for indoor use. All our beams are available with a selection of finishes - we are able to sand the beams, soften the corners, offer a full treatment and waxing service and even hollow the beams to cover steel beams, pipes and cables. We also offer a full delivery service on all beams from a single section to full lorry load. If you have any questions about any of our stock, options or finishes please contact us by using the tag below. Oakfield Beams & Framing first post! Well, here we are! We would like to introduce Oakfield Beams & Framing Ltd.
Based in Horsham in the Sussex countryside, we bring many years of experience to the oak supply and framing industry. We are a small team, but anything we lack in size we make up for in professionalism and honesty. Oak beams have been used for thousands of years in the building and boat-making industry. And that's no stroke of fate. Its because they are strong, durable.... and beautiful! We are able to supply oak beams from green to reclaimed, oak framing from design to fabrication, oak fireplace mantel's, shelving and more! We have a philosophy that to be able to give a great service, you need to love what you do, and what you are working with - and at Oakfield, we truly do. Please feel free to contact us with any questions or enquiries and we will be most happy to help!